YES, i vistited Fonzy the other week with my mom and brother (because my dad was away on a buisness trip). We went at around 4 to 4:30 and its a two hour ride so you can say i got comfterble. When we got to the Elevage we greeted the breeder and his dogs, and he brought out back. When i entered the room, i almost literaly cried because i just could noyt believe one of those is mine... The breeder told us its easy to find him because hes the only male and has the biggest head. But after he checked almost all the puppies to see if they a ding ding (lol) it was the last one that he picked up. After this i thought i was going to get an awesome cute photo of me and Fonzy but the breeder didn't even let me TOUCH HIM! He just stood there with my puppy while he petted him and give kisses and kept saying "of your such a nice boy, your so sweet.." In my head i was thinking "does he not know we are here, is he gonna let me touche or what?!" Okay, so you kind of tell im jelous of the breeder. I didn't say anything, because i didn't want to seem crazy. But i have to say he is one cute looking puppy. He looked so cute and tired, his markings were great and just from the looks of it he looks calm, thats a good thing. But the other thing you'll notice is that he is CHUBBY! The breeder says he's the chubbiest around...hihihi. Fonzyy! 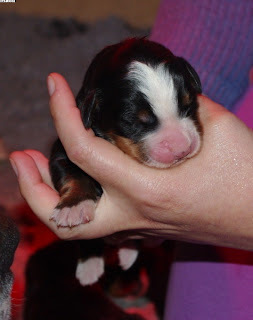 This is a photo the breeder took when he was 3 days old! Isn't he so cute! And he still hasn't even opened his eyes! When I saw this photo i screamed cuz i still couldn't believe that little baby is mine!! The breeders have changed the "gotcha" date to the 5th of January (so far away)! But in 2 and a half weeks i get to see him! I'm so excited! My puppy is born! Welcome to the world Fonzy! I would have preferred to have a separate picture of him but this is fine. "My Dog", I can't wait to say that.. he will be all mine! Somebody I can play with when I'm bored, someone I can snuggle up with on cold nights, someone I can be ultra silly with and he wont care, someone who will always be super happy to see me when I enter the front door. You don't even exist but I love you so much already. I'll take care of you when your sick ( Don't worry that wont happen :P) And I will give the same unconditional love ad you give me, but if you hate me, I'll still love you lol. You will be loved by everyone. I will name you Fold. 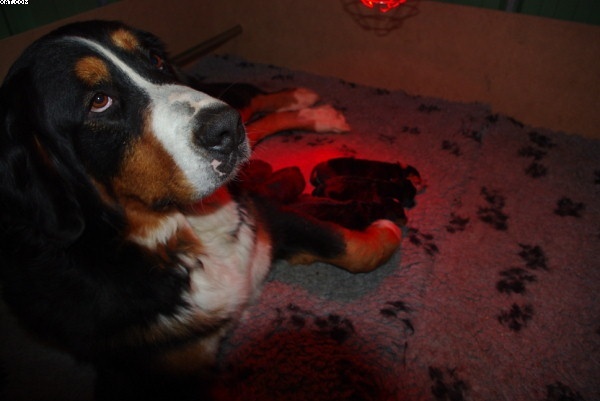 You will have to stay in the breeder's house until your at least 2 months old, because you will still need your mother, like i need mine. Unfortunately you can't sleep in my bed or anywhere up stairs because the stairs are slippery and steep, and it wouldn't be good for your joints. But don't worry the first nights I'll sleep with you downstairs! I will give you the best dog food around, Pro Plan. Well see ya when you get here! Can't wait to meet you! Hii, my name is Laura I'm 13 years old. I speak 4 languages, English, Spanish, Portuguese, and French ( I know, quite a weird mix, I've moved a lot!). I live in France with my parents and my 19 year old brother named Fabrizio. And this will be the story of me and my new Berner puppy. In November 5 a miracle will be born, my first puppy. 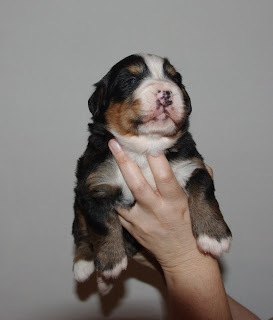 I am getting a Bernese mountain dog! We shall pick him up the 1st of January, to bad it wasn't Christmas...but I think getting a puppy on Christmas day is kinda too much to ask for in my situation. I have been waiting for this day all my life. Two years my parents told me I would never get a dog when they are around... But look what A LOT of persuasion and good grades got me... This is a perfect example of never giving up, If you want it, go for it! My family and I already thought of some names, we wanted something that started with an F so we're thinking of the name Fold (I've kinda be-witched my parents because first we had planned to get a medium-small dog (Labradoodle). But when my friends got a 9 week old Bernese mountain dog, my parents fell in love! My family here has been so happy with the thought of getting a Bernese mountain dog. Even my brother is excited, when I told him that we were getting a Labradoodle, he wasn't so syked...but a few moths later when he figured out we were getting a Berner he flipped! I've kinda of just made this Blog to have something to do and because I love dogs and writing I thought why not make a blog! I know this is not my best piece of writing but I promise I'll get better! I am a sweet dog loving person :)I live in France with my family.